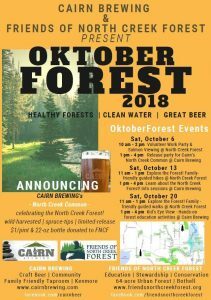 Cairn Brewing, a community-minded brewery and taproom in Kenmore, will partner with Friends of North Creek Forest and the Nature Conservancy for OktoberForest during the month of October. OktoberForest is a national campaign led by the Nature Conservancy to highlight the close connection between the health of our forests and the health of our water—beer’s main ingredient. OktoberForest’s intent is to raise awareness and donations for U.S. forest restoration. Cairn Brewing will bring their OktoberForest participation to the community with a partnership to benefit the mature forest North Creek Forest, located on 64 acres of land just north of downtown Bothell. North Creek Forest is part of the Sammamish River watershed. 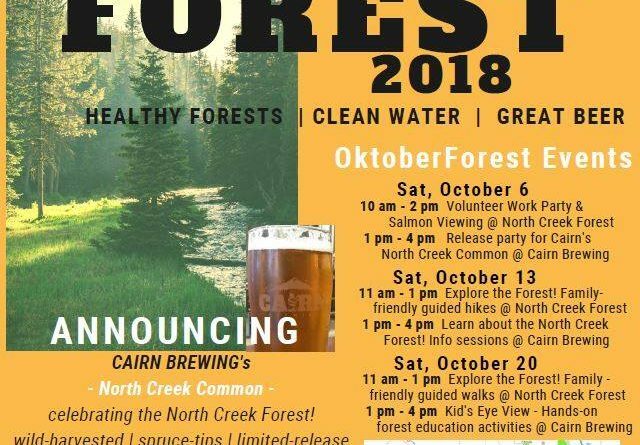 OktoberForest will feature events in North Creek Forest such as work parties and salmon-viewing as well as events in the Cairn taproom including a pub-style talk on the importance of forests to water quality and therefore the brewing process and beer, learning activities for kids and a special craft beer. On Saturday, October 6th, Cairn Brewing will release the North Creek Common, a Kentucky Common ale brewed with spruce tips. The North Creek Common comes in at 28 IBUs and 5.5% ABV. Bill Boyd, brewer and co-owner says “ Beer is mostly water, and in the United States, half of our water is filtered by forests. If you care about quality beer, you must care about protecting our forests and quality water. Drinking the North Creek Common is like “drinking a forest”. The North Creek Common will be available exclusively on tap in the Cairn taproom and in bottles, with a donation of $1 from each pint and bottle sold to Friends of North Creek Forest. Friends of North Creek Forest provides forest education and outreach: hundreds of school children visit the Forest each year. FNCF engages the community: over 500 volunteers contribute 4000 hours/year. FNCF also restores forest edges and maintains the quality interior habitat and provides opportunities for college students working towards careers in environmental science, education and policy. North Creek Forest is a 64-acre mature forest in Bothell, conveniently located just outside downtown Bothell and within walking distance of nearly 10,000 college students attending UW-Bothell and Cascadia College. It meets the Washington Department of Fish & Wildlife’s definition of priority habitat and lies within 12 miles of every school in the Northshore School District. The forest has nine wetlands and seven streams that filter water and protect habitat for endangered salmon living nearby. It is home to over 100 plant species, and a diverse array of wildlife. The forest provides inspiration for art, science and literature across all generations. More information about Friends of North Creek Forest at https://www.friendsnorthcreekforest.org/ and https://www.facebook.com/friendsnorthcreekforest/. Cairn Brewing is an award-winning brewery and taproom located along the Burke-Gilman Trail in Kenmore. Featuring hop-forward beers and lagers brewed on-site, there are currently 14 distinct options on-tap ranging from German Pilsner to Stout (and often an off-list beer or two). The casual setting is family and dog friendly, offers both indoor and beer garden seating, and features light snacks and daily food trucks. Patrons are invited to view the brewing area, relax on couches or at communal tables, play games and enjoy time with family and friends while sampling freshly brewed craft beers. More information about Cairn Brewing at www.cairnbrewing.com and https://www.facebook.com/cairnbeer/. For more information, contact Jen Boyd at Cairn Brewing via [email protected] or call 425-959-5295. ← Kids Can Learn to Code in Bothell!